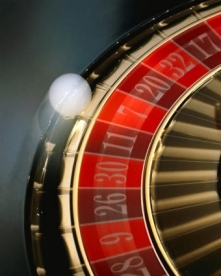 Have you ever tried to cheat at roulette game? If not, you shouldn't even try. If you did, you shouldn't continue. Why? Because it is illegal, and people go to jail for that. Sad, but life is life. In early times of the roulette game the casinos fooled their visitors by putting magnets underneath the wheel on four different sides and certainly into the ball. The dealer is the needed moment would "turn on" the electromagnet and the ball would "escape" the heavy bets area. Usually, it brought large sums of money to the houses. Gradually they realized that reputation is more valuable and the house always wins in a long run. They became more honest and decided to secure themselves too, as there were and are many people, who would like a piece of stake in a "easier" way. Some sneaky players broke into the casinos, put some materials underneath the wheel pockets so that the ball would bounce in a "proper" way. And the next day they would make the winning bets. It is a complicated scheme of cheating. For it you'll need a crooked dealer who would agree to help you. A specific mechanism is required. It should be unseen by anybody. When the ball is thrown, the dealer pulls the lever and a little thingy raises and trips the ball and it fall on the lower row. It is a wonderful cheating method that can easily be applied if none is looking and there is no "eye in the sky". You need to be very quick. It is the time when the dealer turns to look at the winning number and he does not see the table. You need to see the winning number first and put your chips on that number, remove your lost bet before the dealer sees. The most famous living cheater is Richard Marcus, who won over £7 000 000 for over twenty years in gambling. Well, some people call it cheating, others call it power of observation. It is up to you to decide on this. Experienced dealers who have many years of ball throwing develop the muscle memory. It doesn't matter that they were taught to throw the ball with different speeds and they do it professionally. Their arms simply remember what they do and the human brain doesn't develop thousands of patterns of the ball throwing. If you look closer, you will be able to catch the pattern. But it is time consuming.